Vasilion has been skilfully restored to its former glory, with the addition of many luxuries. The result combines the essence of modern living with an atmosphere of tradition; all this is set in grounds with home grown vegetables, fruit and herbs. The very special feature of this property is the antiques and the antiquities. Hellenistic remains have been carefully excavated becoming now part of this garden for visitors’ enjoyment. Vasilion Agrotourism is unique and has more to offer you, relaxation, the traditional Cypriot Hospitality and way of life. If you feel that you don't need to hire a car, Vasilion property is ideal. It is located in the centre of Polis, 15 minutes walk from the sea, 20 minutes walk from Latsi Harbour. Shops, pharmacies, banks, supermarkets, restaurants are only 1 minute walk from Vasilion. Welcome to another sunny and wonderful week! Escape to Vasilion for a relaxing beach holiday! The property consists of a one bedroom house - Despina and a studio- Persa each house has its private patio. A garden with spa pool can be used by both houses. Each house can be rented separately. We live in Nicosia but our heritage property in Polis is being well looked after. Aunty Persa, built the house in 1929. A renovation was done in 1970 by my grandmother Katerina. In 2003, we have decided to renovate the building, with the help and suggestions of the ministry of Interior - Department of Town planning and housing, the Cyprus Tourism and many more, have contributed to create Vasilion Agrotourism and we are all very proud of the result. Now our guests can enjoy this Cypriot venture. 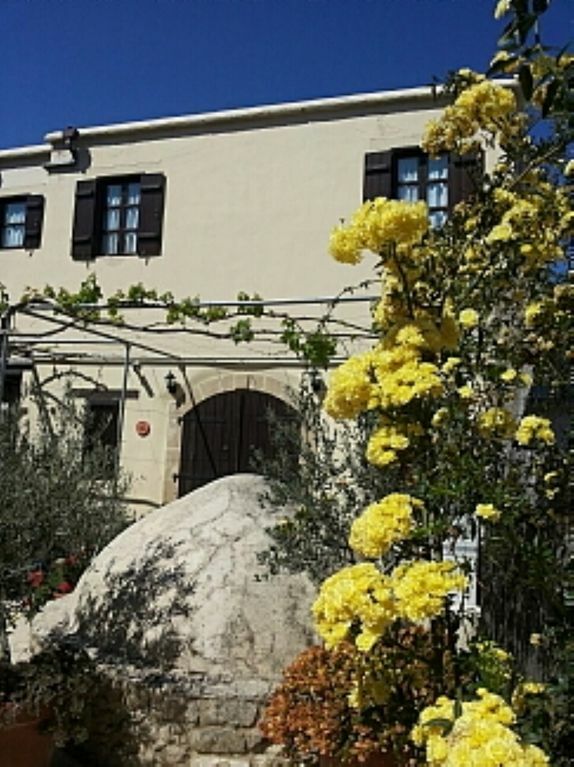 I love gardening, I have decorated the houses and planted the gardens in a way that our guests will feel the Cypriot Hospitality and our warm welcome. The Cyprus Ski Club. The Troodos mountains spring to life not only in the middle of the hot summer as a cool refuge and holiday resort, but also in winter, as this is the skiing centre for Cyprus. 1. Tsada Golf Club is only 30 minutes drive from Vasilion. 2. The Secret Valley Golf Club is located by 'Petra tou Romiou' 50 minutes drive from Vasilion. Notes on accommodation: The properties boast several additional features, including wireless Internet access. Due to the sensitive nature of the properties and their contents, smoking is not permitted inside the properties. The property is more suitable for adults. Bookings from families with small children will be considered accordingly. Bedlinen and towels are supplied, not beach towels. The houses are thoroughly clean before arrival. Extra bedlinen and towels are provided for over week stays. Outside: The gardens are beautifully maintained with plenty of colourful flowers, there is a variety of herbs, vegetables, fruit trees. Several seating areas around the garden ensure you can enjoy the tranquility. A wooden decking area boasts a 5m x 2.5m spa pool, with 2 sunbeds and 4deck chairs, umbrellas, a pool side shower, 2 tables and 8chairs. The traditional clay oven and the antiquities mix with the comfort of today and create a nostalgic atmosphere. Whatever the season, most of your holidays will be spent enjoying the outdoor area. We recommend the months of October, November, March, April, May for people who prefer mild temperatures. July, August ideal for people who prefer warm starry nights, also you can enjoy the sea in late afternoons. June, September warm temperatures during day with cool nights, ideal for people who enjoy quiet beaches. December, January, February ideal for people who seek an escape from heavy winters. One of the best natural beaches in Cyprus where tortoises swim and lay their eggs(July) in the sand is only 10 minutes drive. Latchi port with its famed fish taverns is 5 minutes drive. Polis the Sea Lover's Paradise. Warm crystal clear seas.Discover the magic of the underwater world by snorkelling or diving off the Akamas coast. 'Asprogremos' beach is highly recommended 10 minutes drive from Vasilion. The 'camping area' beach is a 15 minutes walk from Vasilion, a combination of forest and sea. Larnaca Airport is a 2 hours drive. Paphos Airport is a 40 minutes drive. Car hire can be is available at both airports. Taxi services can be found in both airports, or we can arrange transportation. Nicosia the capital of Cyprus is 2 hours drive. Ayia Nappa is 2:30 hours drive. Larnaca is 2 hours drive. Limassol is 1:25 hours drive. Paphos is 40 minutes drive. Polis, in Greek means town, is one of the most beautiful areas in Cyprus near romantic sites, close to where Aphrodite, goddess of love and beauty, used to meet her beloved Adonis. Polis is built on the north of Cyprus, near Akamas Peninsula with its renowned Baths of Aphrodite. Akamas is a nature reserve of exceptional natural beauty and eventually become a national park. The whole Polis area has been beautifully blessed by nature and combines the beauty of mountain, sea and plain. It's seas are clean with cool summer nights. The area is especially suited to people with special interests who enjoy activities when on holiday. Polis is a perfect refuge for mental and physical relaxation and recreation. Those wishing to escape the stress and routine of daily life, will find an ideal place of calm and rest, in an environment of unparalleled beauty. Life in Polis still rolls along at a quiet pace without too many crowds or noise. Akamas Peninsula is in the far west of Cyprus at its most westerly point. Named after the son of Theseus, hero of the Trojan Wars and founder of the city-kingdom of Soli. Akamas Peninsula is an area of outstanding natural beauty deep gorges, a wild landscape, wide sandy bays. It is also an area of great biodiversity and ecological significance. Home to 530 plant species, a third of the total for Cyprus, 126 of which are endemic to Cyprus. An unspoilt wild place thanks to its inaccessibility.There are several wineries in the area, on the way to Panayia Village you can taste the local wine then drive a little further to Chrysorroyiatissa monastery. Drive into the countryside, picturesque villages like Droushia with its tapestry museum, Ineia with its basketry museum, experience the traditions of centuries at Sterna Winery set in the heart of the vineyards at Kathikas. Eastern coastal villages Pomos, Pachiamos, Pyrgos.